Peaceful Acres Lavender Farm is a sustainable, certified organic lavender farm and wellness center located in Martinsville, OH. The farm is located on 10 acres. We are currently growing three acres of lavender, which sustains roughly 3000 plants of eleven different varieties. One half acre is in its seventh year of growth, with the other half acre in its fifth year. During our 2010 SARE project we planted a little over 1000 plants totaling near 2 acres of oil producing varieties of lavender. Varieties include lavandula intermedia ‘Grosso’, lavandula intermedia ‘Provence’ and lavandula intermedia ‘Dutch’. Our field test consists of 12 100-foot rows of #57 limestone gravel and natural sand soil amendments, 12 100-foot rows of #8 limestone gravel and 16 tons of natural sand. Next, we planted 7 rows of non-soil amended rows. All above beds have been raised to required heights per grant proposal, in this case 20 inches. Next we have two additional non-raised soil amended beds which were added post grant approval. Total near 40 rows of lavender have been planted. Each planting scenario has all three varieties. Peaceful Acres produces several organic/natural body care products and handcrafted lavender items. We generate revenue by selling our 35 plus handmade products produced on the farm, dried lavender, and culinary lavender at our farm gift shop, at farmers markets, special events, wholesale to gift shops, restaurants, health food stores and internet sales. We also host regular farm tours, wellness retreats, educational workshops and an annual Summer Solstice Lavender Festival every second weekend in June, we share all of our experiences with other farmers, friends, family and consumers interested in growing lavender. June 15 and 16, 2013 10am-6pm we will host our 5th Annual Summer Solstice Lavender Festival. Enjoy the taste of lavender food supplied by a culinary chef and we’ll have free lavender lemonade during our SARE tour both days. Peaceful Acre’s also in the final stages of constructing an Earthship home. A sustainable structure built utilizing recyclables, including 1400 car tires for the foundation, over 400 cases of brown glass bottles for bricks, 175 cases of wine bottles and 200 cases (24 packs) aluminum cans for filler in mud mortared walls. Utilizing natural resources directly from the ground of our farm has reduced the manufactured materials required for traditional homes. We used 490,000 pounds of dirt packed in tires alone. Estimated weight is 1,250,000 pounds of natural material. This building type requires no HVAC due to the warmth stored in the thermal mass of the foundation and the south facing windows absorbing the sun’s rays for interior heat. Temperatures have not dropped below 57 degrees F degrees in the winter when temperatures hovered near freezing. We organize, host, and facilitate regular community volunteer workshops on green building methods while sharing our alternative lifestyle with visitors. By summer 2011, Peaceful Acres planned to be 100% sustainable off the grid with full utilities. Fortunately we have just received approval on March 1, 2013 to finish our Earthship home which has delayed progress on our final phase. Now we are back on track towards complete sustainable practices and plan to live in our home this summer. Root rot. He planted on tilled non-raised beds and each of these beds were draining from row to row down a slope with the beds running horizontally. Not planting the beds running from high point to low point overwhelmed each bed with runoff from the higher beds. My theory as to why all the plants died had to do with water sitting in beds and draining down the slope from one to another carrying root rot between beds. The farm lost 100% of their plantings in a single winter. Unfortunately no live samples were submitted for testing to determine if root rot was in fact the culprit. Many scenarios have brought farmers, potential farmers and lavender lovers to the farm asking questions about growing lavender. From years of private research and now after completing our SARE research project this experience has determined trial and error short cuts establishing a new lavender crop. This could help eliminate some irreversible mistakes before they are made. Farmers and growers both have submitted experiences to our online questionnaire. Questions asked included growing conditions and problems if they existed. More unedited details are included from these form submissions below. Collaboration begins with the internet. Our established website has information to grow lavender. A web developer uses search engines to monitor traffic, keywords, offer online forms and contact forms to reach out to farmers and growers asking questions about our farm operations and overall planting methods. Many farmers during this journey have helped us determine strategies to implement and avoid specific situations. There are repetitive questions we have been asked during our project. Specifically, why use weed guard, raised beds, and soil amendments for our research? Simply answered, water! Lavender doesn’t tolerate it, lavender is a drought tolerant plant and not much watering is involved after establishing the initial starter plant. Keep lavender high and dry! During our SARE project in 2010 we were contacted to consult for Harmony Farms in Tipp City, Ohio. They planted a few plots of lavender in both 2010 and 2011. Original plantings were introduced to a steep grade. They utilized oyster shell mulch, no raised beds and no-till methods of planting. They are also practicing Bio-Dynamic farming. Their second field has grown to about 1 acre in size. They experienced a high death rate during their 2010 planting due to a rainy May saturating the soil making it impossible to work with. The same situation we were faced with planting our SARE project. Harmony’s initial planting was completed in late August not giving the small starters in 2.5 inch pots a chance to establish and become hardy enough for the winter. Growth for two seasons were noticeably low as they practice Bio Dynamic farming. No fertilizers were applied during planting only compost/ organic material. Growth rates were 1/3 the size of our SARE project after both first and second growing season. We suggested a soil sample for nutrient availability and prepared fertilizer to help their fields grow. A visit will be necessary in summer 2013 to determine growth improvements and run a comparison since they applied the same soil amendments and planting year as the SARE project. Both projects are coming up on full maturity. Lavender planted on a 60 degree slope. No till, no amendments except oyster shell for mulch 12 inches around plant. No fertilizer applied. pH undetermined. Three raised beds located in tiled flat fields near a tree line. Poly weed guard, oyster shell mulch around plant holes. Soil Amendment: 18 inch tall raised beds 3 feet wide, #57 gravel and natural sand. Calculations not exact but very similar to SARE project. Water Source: gravity fed from 3 acre lake. First winter loss: 14 plants lost, total plants not determined. Crop condition; slightly stunted, first year flowers not all harvested to encourage vegetative growth. Sporadic bud shoots. Fourteen raised beds 4 feet w x 130 feet in length, 22 inches tall, well mixed soil amendments of natural sand and gravel Only 10 beds have been planted. Plants suffered extended time in 2.5 inch pots due to extremely wet spring season; something both Peaceful Acres and Harmony Farm experienced. Harmony farms finished planting August 4th and started 3 weeks prior. Plants do seem very susceptible to death as they have no green left on the plants. Will be interesting to see how the overall production results due to the late and unhealthy start. Something every farmer experiences from mother nature. Soil Amendment: 20 inch tall raised beds 4 feet wide, #57 gravel and natural sand. Mixed to a dense ratio, calculations not exact. From visualizing the loamy mixture I suspect many more tons than we applied. Soil samples were taken per test plot before each field was amended and tilled. Soil samples were also taken before the second growing season. pH tested at 7.5. For best results we applied Revita-Pro granular fertilizer broadcasted per linear foot. Fertilizers have been applied during initial planting, second year applied in early spring and every year we will apply fertilizer ReVita-Pro according to soil results. Our research initially started with two different projects. First being hoop house/ low tunnel row covered vs. non-covered lavender fields. Each experiment compared three treatments. The first soil amendment is a tilled mixture of 35% #57 limestone, 15% creek sand, gravel (1/2 inch to 1 inch size) and 50% clay soil. The second test bed will consist of a mixture of 35% #8 limestone (1/8 inch to 1/4 inch size), 15% creek sand and 50% clay soil. The third bed will include no soil amendments(control), using a randomized planting scheme with three replicates per treatment group. We also added two additional test plots implemented with NO raised beds but do have both soil first and second soil amendment scenarios incorporated. Idea was to determine raised beds benefit with amended soil compared to non-raised amended soil. Live plant testing for potential issues were dropped off for testing with Susan Plant Pathologist; C. Wayne Ellett Plant and Pest Diagnostic Clinic, Ohio State University. Harvests measured by 100 stems per bundle. Plants are measured by growth size after the first, second and third seasons. The current SARE project is in early spring stage. Harvesting data cannot be supplied in this report at the moment and will be available after July 2013, post final report. Please report back for FULL HARVEST data for 2013 growing season when full mature harvest data are compiled. Lavender production peaks at full harvest beginning with the third spring growing season. The project was planned anticipating six stages of development. The first step was soil samples, fertilizer requirements and field layout for best drainage. Second step we applied soil amendments outlined in this grant, per 100 foot row on a 50 inch tilled width making sure to keep each bed row 8 feet on center. We then built our raised beds by scraping all the amended tilled soil into mounds sized as specified. Using polypropylene weed guard we cut 4 foot widths by 100 feet in length and covered the raised beds, tucking the edge into the soil. Using an 8 inch round piece of duct work, attached this to a sawn 1 inch x 1 inch x 40 inch piece of lumber to make a handle to hold the circular vent pipe. Then using a curved handled propane tank to burn holes 36 inches on center. Lavender plants were planted with each row containing one specific variety. All three varieties were then planted per amended field plot scenarios for comparison per amended soil type and variety. Third stage requires watering for a few weeks until plants are established and then pruning of all flower buds during the first year growing season to encourage vegetative growth. This is done by not allowing flowers to mature. Fourth Stage we installed low tunnel hoop covers for the winter months. Monitoring each field plot before and after winter storms is essential to finding problems that negatively affect the plants. Fifth stage began with the removal of low tunnel covers. We then collected data from overwintering through detailed count comparisons using damages between 1/2, 3/4 and complete death of each lavender plant. Final counts of plants dead were compared in all rows. Our data recordings included plant tests through Dr. Sally Miller, C. Wayne Ellett Plant and Pest Diagnostic Clinic, Ohio State University. The sixth stage was initiated with light harvesting of mature buds during the second season of growth in early June and throughout July 2012. Light pruning took place after harvesting to assure all stems harvested were not left behind. First seasons harvest averaged near 100 stems or sized at a 2.5 inch round bundle per plant. Steps 1-6 were repeated during 2011, 2012 and will continue for several years to determine quality of plants, harvest and oil production quality and quantity of bundles per plant, row and field in 2013. Seventh Stage involves measuring varieties starting with the largest plant and the smallest average lavender plant to get a comparison from each year of growth. Measurements are taken in fall and again in March and will be repeated in full bloom to measure bud width, height and stem overall height. More details will follow on our first full mature harvest in June and July 2013. Please review our post harvest report coming in Fall 2013. I recommend against replanting directly into the same planting hole where a plant has died. The inoculum in the soil would be readily available to infect the new plant. Dr. Sally Miller, C. Wayne Ellett Plant and Pest Diagnostic Clinic, Ohio State University suggested treatment for Phytophthora Crown Root Rot by utilizing composted horse manure. This suggested treatment reaffirmed our theory of why our existing fields have not experienced any root rot issues. Our private research plantings in 2007 and 2009, one 1/2 acre plot of 17 – 150 foot rows with four rows of ‘Twickle Purple’ and two rows of ‘Grosso’, both oil producing varieties. We planted these fields utilizing a 1/3 amendment of three-year-old composted horse manure and natural sand with two heaping handfuls of #57 gravel around the plant root base. Coincidentally no visible root rot is present. Leaning indicators towards applying a composted manure during initial planting greatly reduces the threat of root rot and is beneficial second to the benefits of having the added organic matter in our clay soil. During spring of 2012 (second growing season) the decision was made not to apply any treatment that works to defend against root rot. As a result two of the three varieties have almost completely died with one last variety thriving near perfectly, ‘Grosso’. The decision not to treat was made because the rot spread rapidly. Instead we let the plants already infected take their course to determine hardiness against the disease, again proving how hardy and tolerant ‘Grosso’ is to root rot. This season 2013 (third season) we will be applying an application of composted horse manure to all lavender crops. Old and new project fields will be treated. During the winter months of 2013 and 2014 an application of Actinovate an ‘OMRI Listed’ spray will be applied 1x a month on all SARE field plots. We aimed to definitively understand and demonstrate the benefits of the use of soil amendments and hoop houses to increase growth in oil producing varieties of lavender under the guidance of Brad Bergefurd of the Ohio State University Extension South Centers. Now that we have achieved an understanding of the beneficial contributions of soil amendments and the use of hoop houses the research can progress into trial and error testing. Although our demonstrative research suggests that soil amendments and use of raised beds are excellent methods for lavender production, we are curious about the potential impacts of these treatment methods that may result in the improvements in plant vitality and production. After completing three years of field research, results have proved that plastic hoop housing/low tunnels are not idea for growing lavender. Unless using another type of ‘breathable’ material, we will not be testing this in our upcoming research plans. No winter damage was present after removing the tunnels in early March 2012 due to high temperatures in the 80’s. However the moisture level under the tunnel created 100% death in ALL covered rows from developing Crown Root Rot just after a few weeks of being uncovered. Initially these rows looked to be doing great with much denser shoots growing than the uncovered rows. White poly low tunnels/ hoop covers are definitely not a good method to protect against winter damage due to the higher moisture levels that are present. No water was applied to these covered rows throughout the winter. Water saturated into the beds from exterior moisture. Raised beds are idea for growing lavender and still prove to be the best growing methods growing lavender. We added (expanded) two additional test plots to our research with non-raised beds but do have both soil amendment scenarios outlined in our application. (The first is a tilled mixture of 35% #57 limestone, 15% creek sand, gravel (1/2 inch to 1 inch size) and 50% clay soil. The second test beds will consist of a mixture of 35% #8 limestone (1/8 inch to 1/4 inch size), 15% creak sand and 50% clay soil.) These non-raised, amended test beds, are growing much slower and are only half the size of our raised bed treated fields. Plants in the non-raised beds ranged from 10 inches up to 16 inches in diameter after the second growing season. Harvest was near nothing with only several bundles harvested in a single field ruling out the commercial likelihood of growing without raised beds; this is not recommended. All our lavender plots are planted on a slope. Comparing the soil amended raised beds to non-amended raised beds shows that the non-amended treatment initially outperformed the amended treatment because it had an earlier bloom from the same varieties compared. Comparing stem thickness, bud size and lengths of the lavender spikes were noticeable larger in the non-amended raised beds at first. Most plants in the raised non-amended soil produced earlier than amended soil with 1/8 inch thick stem bases at the cutting point just two nodes above the brown woody growth. Bud sets were much denser and have elongated spikes/stems up to 18-20 inches in length. These are some of the largest spikes we have dealt with on the farm to date. The trichomes/stem hairs produced a very resonated stem, much stickier than the other two amended fields. However survival rates and plant size are comparable between both amended fields. The #8 limestone North field has the largest dimensional growth size per all raised beds and amendments. In second place #57 south field runs just a few inches less than the North field at 27 inches x 29 inches. Quick Quality Overview; Research during this project shows better growth quality in raised beds with #8 limestone soil amendment, #57 limestone beds are second and no-amendment is last. Hoop housing with non-breathable cover causes complete death and the Root Rot resistance shown by the cultivar ‘Grosso’ is superb compared to other varieties like Dutch and Provence oil producing lavender varieties grown during this project. Starting from scratch we initiated our project with soil samples. This assured the proper pH above 6.5; our fields tested at 7.5 which is excellent for lavender production. A pH between 7-8 is ideal. We then applied gravel and natural sand according to our grant application spreading by linear footage of the beds. These soil amendments were applied by linear footage, tilled in and then mounded to 20 inches in height. Fertilizer was broadcasted by linear foot of the raised bed with a granular ReVita Pro ‘OMRI’ listed natural fertilizer. After planting we initially watered only one single day out of four weeks due to frequent rain. However as outlined in our grant we planned to water every seven days without rain. Our decision was made not to water so often as several years of lavender growing shows better quality and growth rates when refraining from watering. This decision was made due to continuous downpours in June and July, and because the lavender quickly established, we decided to keep them high and dry. Private research we have found and experienced on our own proved lavender to do the best with less water. We also lightly removed small soil samples under the weed guard to assure the soil was not overly dried out. Our earlier research suggests to only water as needed in the mornings and particularly on dry, hot days during dry spells. No water was applied during the winter due to saturated soil. Pruning of all lavender buds as soon as they shoot out is extremely important in forming a nice strong lavender hedge the first season, encouraging vegetative growth. The first season during August our 2010 season’s growth was exceptional going into fall. On the second year of growth you can harvest your lavender spikes. This pre-harvest should range between 1/3 to 1/2 a full harvest, also up to one or two bundles per plant. This year, 2013, will be our 3rd year of maturity at our first full harvest. A report will be written on our post-final report for harvest data. We’ll record harvest average per plant, per row, and per treatment and submit to our SARE online grant profile. Mowing between rows is important in keeping weeds down outside the raised bed’s weed guard. If you use a side discharge mower as most do, you will need to clear the debris that shoots up under the lavender plant to reduce risk of rot. You can blow this off with a leaf blower on low or use your hands and a broom to sweep the debris off. Near the fourth year of growing and after as needed, light pruning can be done to the lower half of the lavender plants to keep them from laying on the weed guard where the debris can pose an issue. Lavender branches shed and build up potentially harmful rot situations if the tiny leaves are not removed every spring season. This increases circulation between branches; very important in humid climates. Horse Manure is a plus. Our privately researched 2007 and 2009 fields are two seperate 1/2 acre plots showing no root rot. Field 2007 soil was amended with three year composted horse manure. Field 2009 was amended with woodland floor soil and debris that were scraped into a mound and composted. Both these fields are healthy and thriving. Field 2007 has ‘Twickle Purple’ and ‘Grosso’ oil producing varieties growing well. Both cultivars experienced extensive ice damage from prior winter storms and snow pack burn damaged the center of plants but no root rot. Field 2007 are 18 inch raised beds, soil is amended with two heaping handfuls of limestone gravel, 10% creek sand, 10% Organic mulch and 75% clay soil tilled in. This half acre consists of the following varieties: Angustifolia ‘Nana’, ‘Lady’, ‘Rosea’, ‘Twickle Purple’, ‘English’, ‘Hidecote’, ‘Munstead’, and Lavandula x Intermedia ‘Grosso’. The healthiest experience with amended treatment thus far outside of the SARE project is the two heaping handfuls of limestone gravel, 10% creek sand, 10% Organic mulch and 75% clay soil tilled in. The key here is Organic mulch and horse manure; chicken manure has not been tested yet. However, these 2007 and 2008 fields are mostly Angustifolias and are much easier to grow than Lavandula x Intermedia varieties but do not product the quantity, size and oil needed for commercial production. One important detail to keep in mind is drainage. As much as I have averted water there is no stopping it. You can only divert the water and not stop mother nature from sending it. I will be applying numerous drain tiles throughout current fields and under all new plots before applying amendments from here on out. This extra precaution will go a long way in lavender cultivation. Results to come in future reports. Brad Bergesfurd an OSU South Center Educator; Brad has been our knowledge outlet helping us with fertilizer requirements, consultations on specific weather scenarios that required early season action in both March and April 2012. He also advised us to OSU for plant diagnostics. Kym, Shade, Lainey, and Phoebi provided planting, harvesters, field weeding, pruning and cleanup. Mike Prell, Project coordinator, task manager and research result data collecting and comparison. Field images, growth comparisons by image and measuring. and issues they’re having with an initial planting. 2013 Data coming on survival rates, soil samples and harvest data and will be reported in our 2013 Fall Post-Final report. Grow Food Grow Hope AmeriCorps employees volunteered labor removing dead plants and putting into bags to take to the burn pile. Also helped with hoop/tunnel cleanup. Eric Guindon, Field labor, task management. John Cropper, Photographer and videographer. No harvest data is available for first year growth, pruned budding shoots off. Second year averaged three bundles (100 stems) per surviving bush. No harvest was taken from any root rot infected plant to avoid spreading root rot. This June and July of 2013 we’ll have the final harvest results based on our full maturity and third year in the ground. These results will be available by Fall 2013 and will be reported post project completion. These three full growing seasons are needed to record mature harvest. Plant circumference was recorded and measured based on preliminary pre-maturity harvest of stem width, spike length and bud form/size. Survival rates were recorded by field counting and examining each plant for percentage of damage or death per row. Results are recorded in a spreadsheet attached. All dead plants were bagged and removed from the field and immediately burned downwind. Many farmers, groups, individuals and potential lavender growers visited our farm though 2010, 2011 and 2012. Our website http://peacefulacreslavenderfarm.com has increased traffic to nearly 15000 visitors per year. Dozens of calls, emails and visitors have inquired about our lavender research project. Our Summer Solstice Lavender Festival brought in over 1500 visitors with about 30 attendees during our lavender research tours. Many visitors were treated to our lavender lemonade and were supplied handouts on our SARE Research presentation. Everyone is invited to attend our SARE research project tours during the 2013 lavender festival. March 9th, 2013 Peaceful Acres presented research findings at the Small Farming Conference located at the Wilmington College. A slideshow is attached for reference as a guest speaker at the conference. The research and progress towards lavender production will continue over the next several years. First thing for 2013 winter we’ll be trying another breathable material for low tunnel hoops instead of the white poly. Next season’s planting I will install drain tile under all beds planted. This will increase water drainage out of the beds, reduce death rates but will increase planting cost. Our 2013 new lavender plots will utilize soil amendments as follows: composted horse manure, 16 tons of natural sand per 12 beds at 100 foot long rows and two heaping handfuls of gravel per planting hole. Raised beds will be raised to 28 inches; 8 inches higher than our project due to the ground settling experienced. The disadvantages to our project steer towards our loss in production. Putting up half the plant cost and losing the half is essential towards our research but does lead to second thoughts on what was done wrong and what should have been done pre-planting and do we want to match this half cost again when not working with a crop that is guaranteed. Peaceful Acres Lavender Farm has also learned a lot about commitment with parties involved in this grant. Although our help was planned it did not turn out in our favor after the end of the first growing season. The majority of our labor had to be hired out and research was conducted with more of our family members. The project turned out to be an experience for the whole family helping us. In the future I may contact additional farms to research collaboratively to avoid lack of labor commitment for the end goal and coordinate these projects with my children helping them learn more about farming and research. Working with tour groups many youth have realized how much work a small farm can be and how much time farmers actually put into projects. Telling our story about our experience building a home really makes everyone think about the possibility as we do without a mortgage, working towards building a sustainable life without the typical 30 year mortgage. Easing up possible burdens in retirement years. Potential farmers and home gardeners have acquired information from our farm, now they can share other experiences we’ve shared to help them set a plan to produce lavender. When visitors see our small farm operate in engaging research projects this boosts their interest in farming. Not only from lavender in general but how many crops are not being grown in Ohio because of a lack of research. Possibilities for a niche crop is readily available. We see regional potential building from our research and ideas. New crops, new ideas and collaboration is growing in our community. To this day Peaceful Acres Lavender Farm has conducted on-farm lavender tours from 2010 thru November 2012 to hundreds of attendees and two speaking engagements about lavender growing and our project. The majority of our visitors found us through SEO-Search Engine Optimization strategies in place to maximize search results for growers and future growers interested in lavender. We have answered many emails and telephone calls and had face-to-face visits to determine some growing issues, techniques other farmers experienced, and to help potential growers get started and positively influence their planning process. Many current lavender growers submitted a questionnaire explaining their growing conditions. This allows us to implement larger regional issues and success. Research collaboration extended into Social media and specific groups on Facebook, ‘The Business of Lavender Professionals’. Here we have collaborated growing, harvesting and product input to help farmers improve. It has been a hot spot for lavender growers only. We have a current list of members to this group. We have entertained the St. Ursula Academy teachers and high school seniors design class with a detailed tour of our lavender fields. They also volunteered applying cob mud to our Earthship home interior walls. Eighteen tour groups have come through with an estimated 170 visitors. Six lavender growers have visited and four potential lavender farmers have toured the fields for tips and questions. Three Ohio homeschooling groups have visited to learn more about our research project and how we conducted the tasks involved in planting commercial lavender. By planning our upcoming yearly events for 2013-2014 both summer and winter seasons we’ll continue to encourage lavender farming. Peaceful Acres will be attending a few other presentation events through the Ohio State Extension Office and will continue providing farm tours for our SARE research. Visitors can receive a full copy of our findings and our results will be publicized on our website and social media outlets as well as the regional SARE website. Access to print material will be readily available online for download and can be requested by mail post 2013 Harvest data. Growers whom showed interest and submitted our questionnaire will receive a full color copy of our research post harvest data 2013 summer. Any grower requesting these documents will receive this information. Rack cards for the 2013 Lavender Festival and SARE lavender tour will be available to share the first week in April 2013 as well as follow up Newsletters the next few months around bloom. We’ll have print material inviting farmers and anyone interested a chance to learn about our results. This past winter in the Pacific NW we had unusual early sub-freezing temperatures in November resulting in a 10% loss of plants. Soil Amendment: bone meal and composted chicken manure at planting, annual application of fall dolomite lime, spring bone meal. Comment: Am just dabbling in this for now. Hope to have a 20 foot x 40 foot plot planted by this time next year. Soil Amendments: gravel, natural sand, compost, bone meal. Damage: Snow pack burn … when the snow rests on the plants for a long period of time, it burns out the centers. We are experimenting with letting the plants grow long and not pruning until Spring. Weed Guard:woven landscape cloth, oyster shell and the field was amended with natural lime. Damage: All plants appear to show new green growth. Some are much more advanced than others. Few have over 70% green growth and most are less than 25%. These are 2 year old plants. All very healthy going into winter. No physical damage from snow or rain is apparent. Comment: Hi, I lost one hidecote giant this winter, they others are fine with a little die back. Established plants greened up quickly. Marge Clarks and Provence are the slowest to green up. I do not mound up my plants as they are planted on a naturally draining slope. I get a little yellowing of some plants on one end, but they green up so far. I would love to get some mushroom compost as I just got the lavender lover’s handbook from stonegate lavender farm and that is recommended but I can’t find it. Also, I am trying to find calcium magnesium fertilizer as that has been recommended by the good folks at Neob Lavender. My munsteads are the oldest, three years in the ground. I am still learning each year, and modifying how I plant them. I would love to test the soil, if given the information to do so. Peaceful Acres Lavender Farm is a sustainable, certified organic lavender farm and wellness center located in Martinsville, OH. The farm is located on 10 acres. We are currently growing one acre of lavender, which sustains roughly 2000 plants of nine different varieties. One half acre is in its fourth year of growth, with the other half acre in its third year. Lavender is considered a highly sustainable crop because it does not rely on pesticides and little fertilizer to grow after the 3rd year. Lavender is an 8-10 year perennial. Currently we are independently researching our one acre of lavender. Our beds are raised 18 inches and the soil has been amended with two heaping handfuls of limestone gravel, 10% creek sand, 10% Organic mulch and 75% clay soil tilled in. This acre consists of the following varieties: "Angustifolia" Nana, Lady, Rosea, Twickle Purple, English, Hidecote, and Munstead. We currently have two 100-foot test beds of "Lavandula" Grosso, which is our largest variety oil producer. These preliminary trial beds have shown a slight increase in growth leading us towards more research. Peaceful Acres produces several organic/natural body care products and handcrafted lavender items. We generate revenue by selling our products, dried lavender, and culinary lavender at our gift shop on the farm and at farmers markets, special events, wholesale to gift shops, restaurants, health food stores and online sales. We also host regular farm tours, wellness retreats, educational workshops and an annual Summer Solstice Lavender Festival every June where we share all of our experiences with other farmers and consumers interested in growing lavender. Peaceful Acres is also in the process of constructing an Earthship, a sustainable structure built utilizing recyclables. We organize, host, and facilitate regular community workshops on green building methods along with alternative lifestyles through reducing, reusing and recycling consumer goods. By summer 2011, Peaceful Acres will be 100% sustainable off the grid with full utilities. Lavender prefers dryer root system for ideal growing conditions. Poor yields and low survival rates exist in lavender for our region due to the Midwest humid and moist conditions, which causes death by root rot. This is especially true in oil producing varieties. The ability to grow oil producers is also slim due to cold winters in our region. During winters, the oil within the plant is susceptible to freezing, causing die back and greatly reducing yields. This problem is essential to our farm because we are a specialty lavender dedicated farm interested in increasing current yields and increasing the likelihood of extracting pure essential oils in Ohio. To test solutions to the problem, we will be experimenting with two different soil amendments for drainage. Proper drainage reduces root rot. These amendments will include gravel limestone, creek sand and oyster shell added to the current clay soil conditions. Additionally, we will be experimenting with controlling growing conditions by low hoop housing through the winter months. The proposed project will be a one-acre planting of lavender comprised of 34 100-foot-rows, utilizing 50 to 60 lavender plants per row depending on maturity size of the variety. Different growing conditions will include hoop housing lavender during winter months with and without soil amendments. Our problem addresses a surmounting issue with the poor yields and low winter survival rates due to winter injury on lavender crops, especially the oil producing variety Lavandula "Grosso". Recent conversations with other lavender farms in the Midwest and interested future commercial lavender growers also reflect that this is an ongoing problem for many growers in the Midwest causing hesitation to move forward into commercial lavender production. 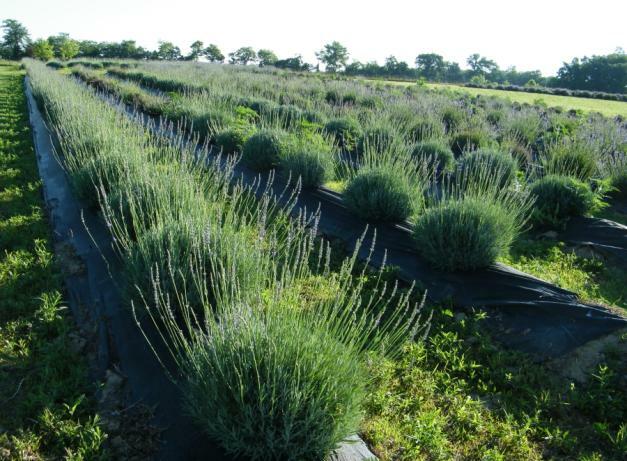 In a review of our preliminary observational data from 2010, we have subjectively noted that the use of wind breaks, and raised beds had dramatically increased oil levels in harvested plants as well as greatly reduced winter injury of lavender. While testing one single row cover results had damaging effects from the cover breaking valuable lavender stems and reduced overall growth and oil production. Peaceful Acres farm would like to expand on the 2010 trials, scaling up our experiment to include two different projects, hoop house-covered vs. non-covered lavender fields. Each experiment will compare three treatments. The first is a tilled mixture of 35% #57 limestone, 15% creek sand, gravel (1/2" to 1" size) and 50% clay soil. The second test beds will consist of a mixture of 35% #8 limestone (1/8 inch to 1/4 inch size), 15% creek sand and 50% clay soil. The third bed will include no soil amendments (control), using a randomized planting scheme with three replicates per treatment group. We aim to definitively understand and demonstrate the benefits of the use of soil amendments and hoop houses to other lavender growers, as we have not found any significant work in this area in our background research. Protocols for our experiments will be designed and written under the guidance of Brad Bergefurd of the Ohio State University Extension South Centers. Our aim is to gain an understanding of the beneficial contributions of soil amendments and the use of hoop houses. Although our subjective research already suggests that soil amendments and use of raised beds and covers are excellent production methods for lavender production, we are curious about the potential impacts of these treatment methods that may result in the improvements in plant vitality and production. The use of monitoring equipment, the HOBO U30USB Data Logger-U30 (Solar Powered) would allow us to monitor critical environmental variables. Data collection will occur three times each week during the harvest period during the course of the experiment. Rain events will provide water to the plants and in the event of a long drought (as our soil has high clay content), watering will occur once every 11 days via drip irrigation on a standard treatment for each row.